George Pas, formerly of 6th Battalion The Rifles. Sergeant George Pas served as a Reservist with 6th Battalion The Rifles for over 14 years, completing tours of Afghanistan, Ukraine, America and Cyprus. An exemplary soldier, George rose through the ranks, earned a Lord Lieutenant’s Certificate of Commendation for Meritorious Voluntary Service and a Colonel in Chief’s commendation signed by HRH Prince Philip. But in 2011, just before George was due to start his third tour of Afghanistan as a newly promoted Platoon Sergeant, disaster struck. He was involved in a serious road traffic accident whilst travelling on his motorbike and sustained catastrophic injuries, including breaking his back in eight places. George was paralysed from the chest down and now relies on a wheelchair for mobility. Yet despite the debilitating nature of his injuries and the effect they have had on George’s day-to-day life, his thirst for a challenge has never waned. 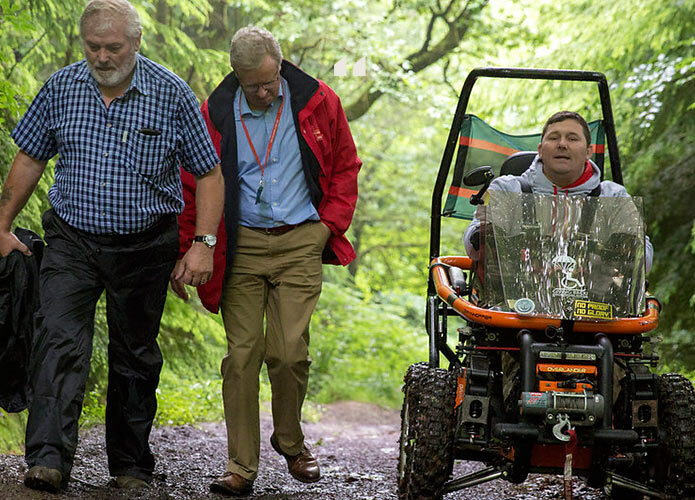 Determined to still do as many outdoor activities as possible, in 2013 George approached ABF The Soldiers’ Charity for help towards the costs of an all-terrain mobility aid. 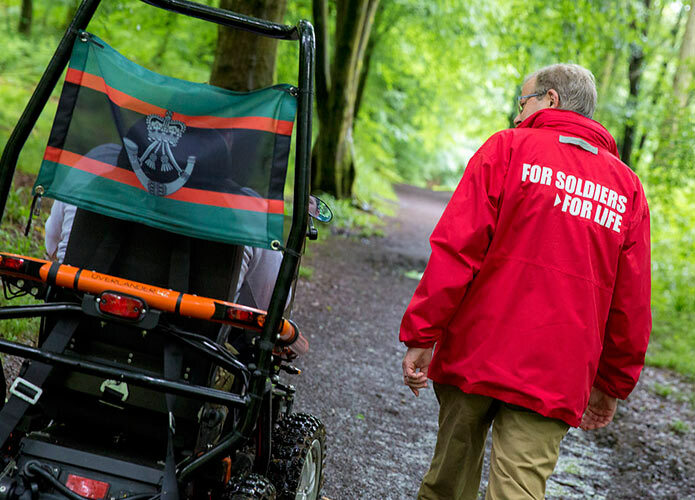 The ‘Overlander’ is an electrically powered, off-road mobility vehicle designed to tackle extreme outdoor surfaces: an ideal tool for an injured, but intrepid, former soldier. George had already raised part of the £14,000 required towards the price of the Overlander through completing a number of challenges, including a sky dive and an abseil, before Service charities, including The Soldiers’ Charity, stepped in to make up the difference. Life before the Overlander meant that George would have to stay behind at home whilst his family went on outings, such was the extent of his limited mobility. Thanks to the help of The Soldiers’ Charity, George is now able to take part in outdoor adventures with his friends and family including his wife, Emma, and their three children: Dana, Carl and Piper. 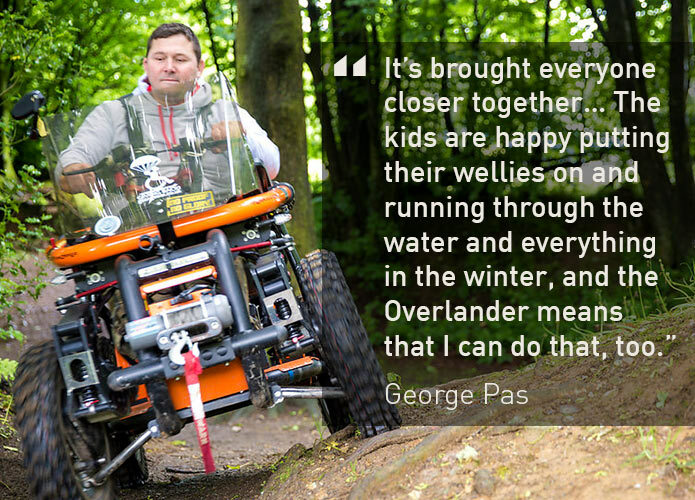 The Overlander has enabled George to do things that simply would not be possible in a regular wheelchair: going into the forest, travelling through boggy fields and wading into the sea at near waist-depth. George has even set to attempt to scale The Three Peaks in the Overlander. Almost conquering Snowdon in 2015, he has his sights set on attempting Ben Nevis and Scafell Pike in the future. George also believes that the Overlander has had a positive impact on his family life, by affording those opportunities for the family to enjoy more outdoor activities together “It’s brought everyone closer together… The kids are quite happy putting their wellies on and running all through the water and everything in the winter, with the dog, and the Overlander means that I can do that, too”. By making a donation you can help us support injured veterans like George and their families, and provide them with the independence and dignity they deserve.